Before the fireworks were lit and showing some “rockets red glare”, there were some different fireworks set off at the feet of the Statue of Liberty. 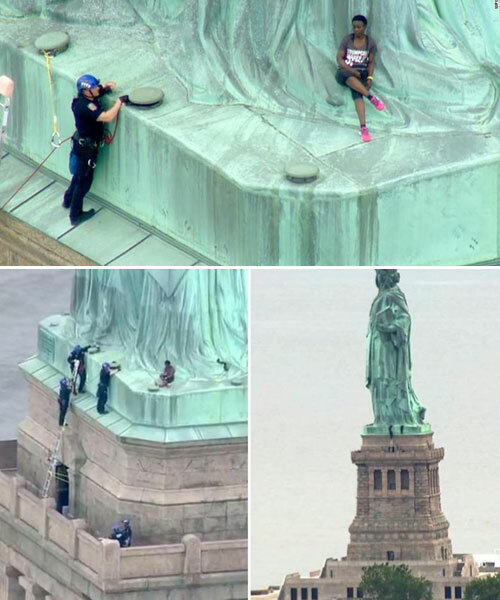 “A woman who climbed up on the Statue of Liberty and sat on the monument’s base is in detention, police say. US officials identified her as Therese Okoumou, a 44-year-old immigrant from the Democratic Republic of Congo. You can read the whole BBC News article using the link below but it does seem to be the perfect metaphor for America’s “struggle to climb out from under British oppression”. I’m sure the irony of this being reported by the British media on American “Independence Day” gave a lot of people a chuckle. This kind of inspired action may come in handy as we begin the struggle over the nomination of the next Supreme Court Justice.